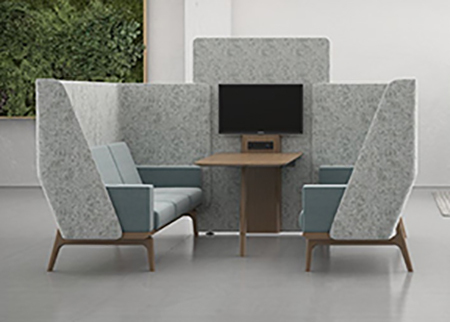 It’s one week post-NeoCon, and so we present an iteration of Contract magazine’s Best of NeoCon 2017 competition of contract furnishings products. The esteemed awards competition recognized 89 products by 59 companies in 44 categories; that’s one more award than last year’s count! 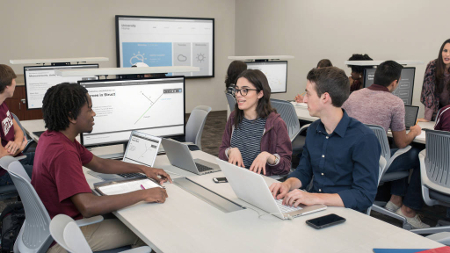 The honors included 39 Gold Awards, 42 Silver Awards, 10 Innovation Awards, and five Editors’ Choice Awards for a total of 97 awards including Best of Competition. 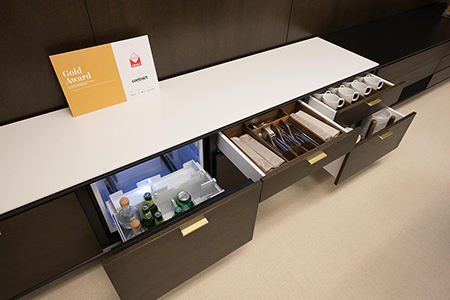 Our officeinsight team did its very best to find and see each winning product in person during the show; in case you missed a few, or didn’t attend, peruse at your pleasure! 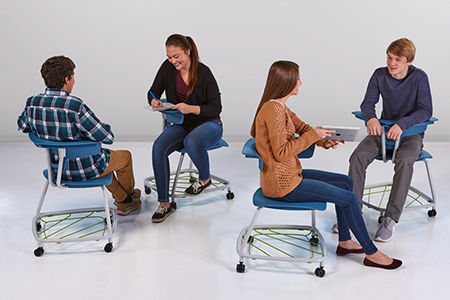 HALCON won Best of Competition with Halo, Gold Award winner in the Conference Room Furniture category and also Gold Award winner in Height-Adjustable Tables. HNI Corp. subsidiaries won seven awards. 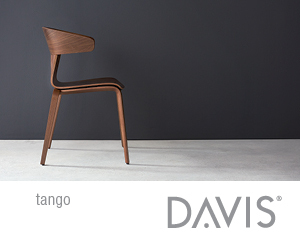 Gunlocke received Gold for Calm Lounge Collection, Tia Barstools, and Tia Guest seating, plus Editors’ Choice for Calia. 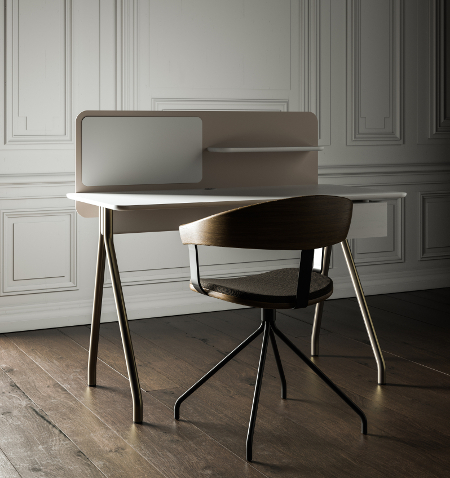 HBF won Silver for Simple Writing Desk and Editors’ Choice for Harmoni Table by Space Copenhagen. 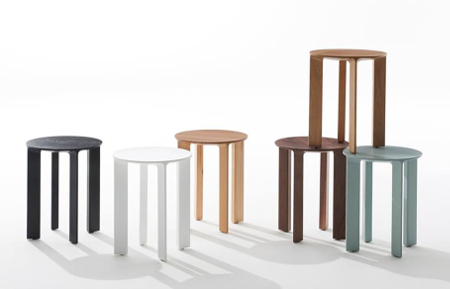 HBF Textiles won Silver for Raw Materials Collection. 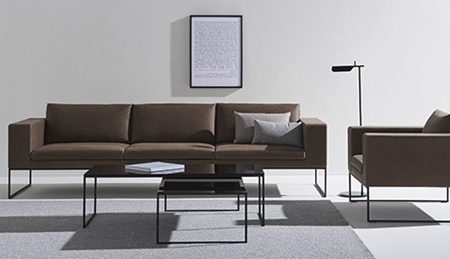 Davis Furniture was also a big winner this year with three Gold Awards (for Hans, Weda, and Reed), one Silver (for Nora), and one Innovation Award (for Q6). 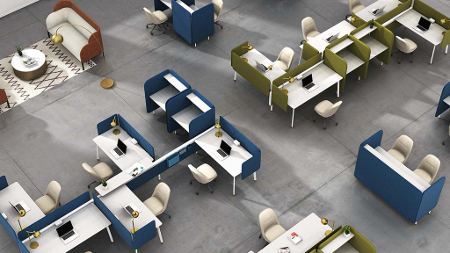 Steelcase and subsidiary Designtex together received five awards. 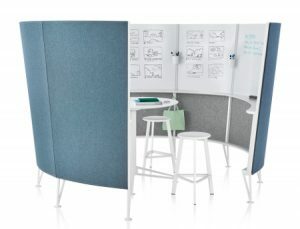 Surround by Steelcase Health won Gold; Verb® Active Media Table by Steelcase Education won Silver; Biophilia Collection by Designtex won Gold, and Casper Cloaking Technology by Designtex won both Silver and Innovation Awards. 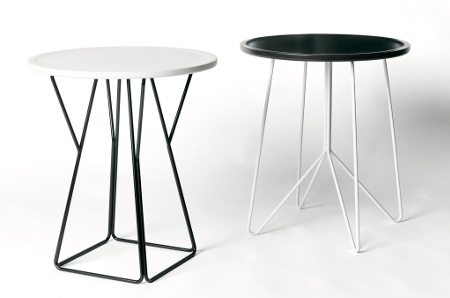 Andreu World won four awards – Gold for Radial High Table and Capri Lounge, and Silver for Smart Barstool and Lake. 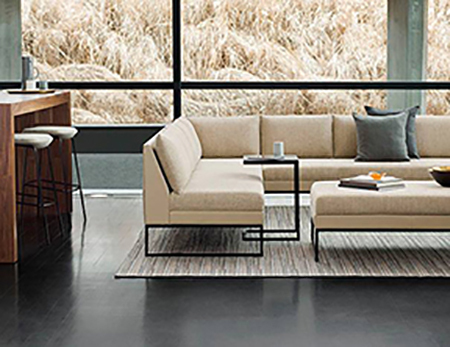 Inscape and West Elm Workspace with Inscape together won four awards. 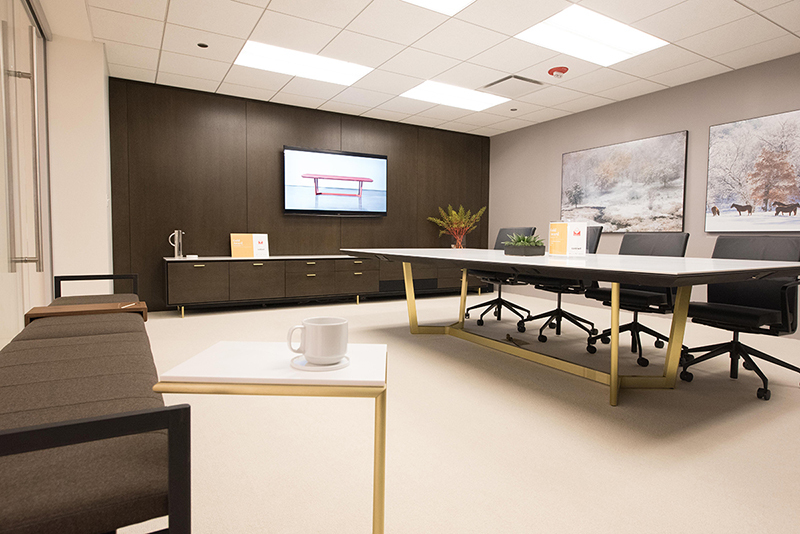 Inscape’s Arrivals Bench won Gold, and West Elm Workspace with Inscape received both Gold and Silver for Conduit by Gensler, plus Gold for Linear Wood LED Lighting. 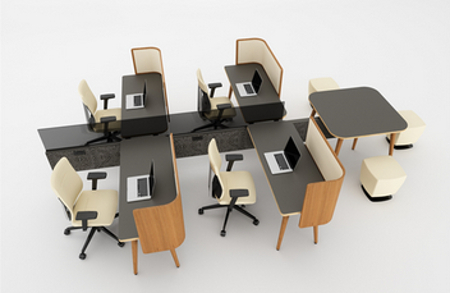 Mohawk Group won three Gold Awards – for the Lichen Collection, Lineate, and Visual Interactive Studio. 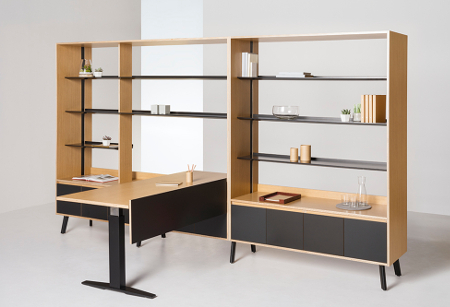 KI and Pallas Textiles together won three Gold Awards, for KI’s Ruckus Collection and Universal Height-Adjustable Screen and Pallas Textiles’ Loft Collection. 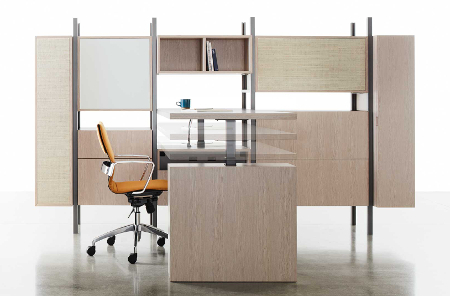 Skyline Design also received three awards – two Golds and one Editors’ Choice – all for the same product, Transcend™ by Suzanne Tick. 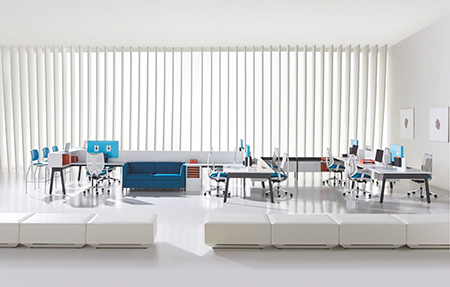 Teknion won Gold for Altos Landscape, plus two Silvers – for Expansion City Line and enhancements to Zones, which was Best of Competition winner last year. OFS won three Silver Awards, for Heya, Wyre, and Hug. Companies winning two awards each included Bentley, Bernhardt Design, Bolyu, Carnegie, Herman Miller, Snowsound, and Vitra. 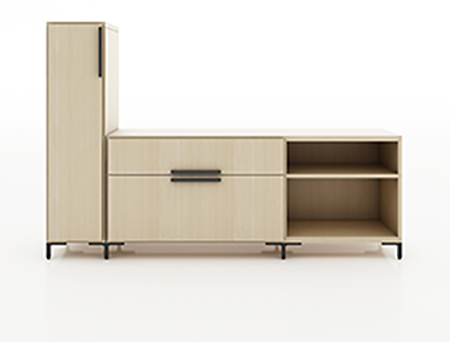 Modern sideboard storage and bench seating options complement the HALO tables and can be configured to meet any need. 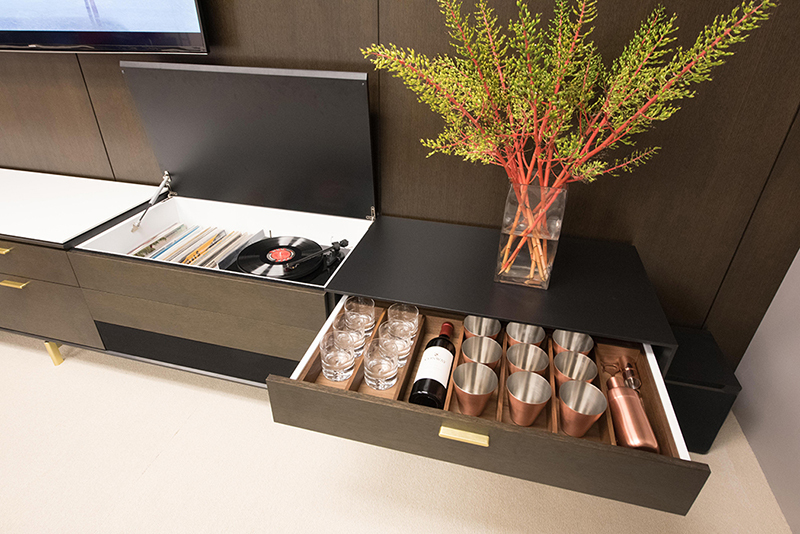 In the storage components, thoughtful modules accommodate everything from refrigeration and waste bins to cutlery, glassware and dishware, including magnetized pieces to accommodate different sized dishes, and even a record player with speaker system (during our visit to the showroom, HALCON was spinning Kind of Blue by Miles Davis – swoon). 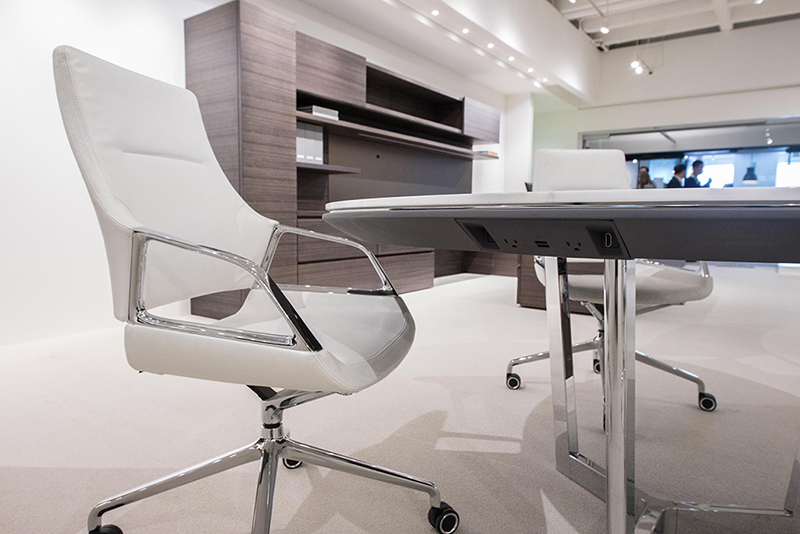 The fully configurable system provides a complete range of components available in multiple heights, widths and depths; these mix-and-match pieces bring charm, exclusivity and comfort to a collection that will cater to designers and clients who want something that feels luxurious, professional, relaxing and welcoming all at once. 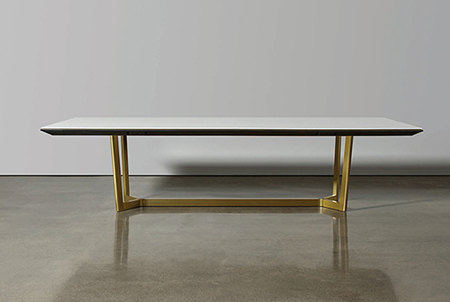 The metal finishes for finger pulls and bases for the Halo table, credenza and bench are on point with color and finish trends; designers may choose from polished chrome, brushed satin aluminum, brushed brass, light bronze, deep bronze and black anodize. -GOLD: Halo by HALCON: See Best of Competition winner, above. 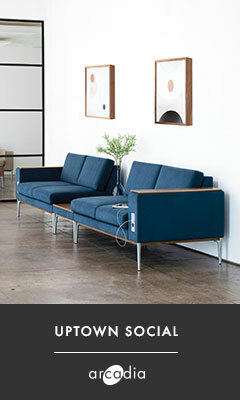 -GOLD: Conduit by Gensler by West Elm Workspace with Inscape: See description in Furniture: Benching, above. 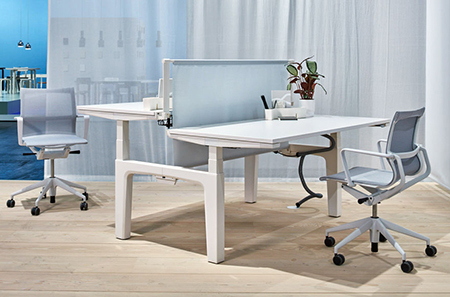 -INNOVATION: Citterio Desking System (CDS) by Vitra: See above.